Yersinia enterocolitica, an important food- and water-borne enteric pathogen is represented by six biovars viz. 1A, 1B, 2, 3, 4 and 5. Despite the lack of recognized virulence determinants, some biovar 1A strains have been reported to produce disease symptoms resembling that produced by known pathogenic biovars (1B, 2-5). It is therefore imperative to identify determinants that might contribute to the pathogenicity of Y. enterocolitica biovar 1A strains. Y. enterocolitica invariably produces urease and the role of this enzyme in the virulence of biovar 1B and biovar 4 strains has been reported recently. The objective of this work was to study genetic organization of the urease (ure) gene complex of Y. enterocolitica biovar 1A, biochemical characterization of the urease, and the survival of these strains under acidic conditions in vitro. The ure gene complex (ureABCEFGD) of Y. enterocolitica biovar 1A included three structural and four accessory genes, which were contiguous and was flanked by a urea transport (yut) gene on the 3' side. Differences were identified in ure gene complex of biovar 1A strain compared to biovar 1B and 4 strains. This included a smaller ureB gene and larger intergenic regions between the structural genes. The crude urease preparation exhibited optimal pH and temperature of 5.5 and 65°C respectively, and Michaelis-Menten kinetics with a Km of 1.7 ± 0.4 mM urea and Vmax of 7.29 ± 0.42 μmol of ammonia released/min/mg protein. 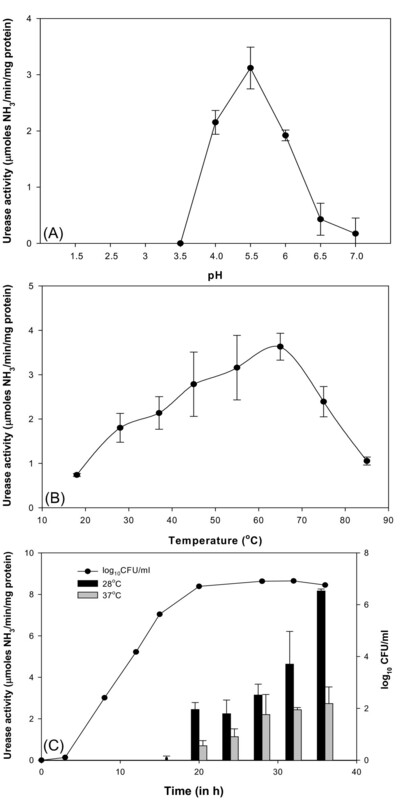 The urease activity was dependent on growth temperature and growth phase of Y. enterocolitica biovar 1A, and the presence of nickel in the medium. The molecular mass of the enzyme was > 545 kDa and an isoelectric point of 5.2. The number of viable Y. enterocolitica biovar 1A decreased significantly when incubated at pH 2.5 for 2 h. However, no such decrease was observed at this pH in the presence of urea. The ure gene cluster of biovar 1A strains though similar to biovar 1B and 4 strains, exhibited important differences. The study also showed the ability of biovar 1A strains of Y. enterocolitica to survive at highly acidic pH in vitro in the presence of urea. Yersinia enterocolitica, an important food- and water-borne human enteropathogen is known to cause a variety of gastrointestinal problems. Most commonly, it causes acute diarrhea, terminal ileitis and mesenteric lymphadenitis . Long-term sequelae following infection include reactive arthritis and erythema nodosum . Blood transfusion associated septicemia due to Y. enterocolitica has been reported to have high mortality . Currently, Y. enterocolitica is represented by six biovars (1A, 1B, 2, 3, 4 and 5) and more than 30 distinct serovars. The virulence of known pathogenic biovars namely 1B and 2-5 is attributed to pYV (plasmid for Yersinia virulence) plasmid  and chromosomally borne virulence factors . The biovar 1A strains however lack pYV plasmid and have generally been regarded as avirulent. But several clinical, epidemiological and experimental evidences indicate their potential pathogenicity . Some biovar 1A strains have been reported to produce disease symptoms resembling that produced by pathogenic biovars [6, 7]. These have been implicated in nosocomial  and food-borne  outbreaks and isolated from extra-intestinal sites . The biovar 1A strains also invade epithelial cells [11, 12], resist killing by macrophages  and carry virulence-associated genes such as ystB (enterotoxin), inv (invasin), myfA (fimbriae), hreP (subtilisin/kexin-like protease) and tccC (insecticidal-toxin like complex) [5, 14]. In the past, enterotoxin has been thought to be the only major virulence factor produced by biovar 1A strains. Recently insecticidal-toxin complex  and flagella  have been identified as virulence factors of Y. enterocolitica biovar 1A strains. However the exact mechanisms underlying the pathogenesis by biovar 1A strains remains unclear and there is need to investigate the role of other putative virulence factors. Urease (urea amidohydrolase; EC 3.5.1.5) has been implicated to play a role in the pathogenesis of many bacteria such as Helicobacter pylori, Proteus mirabilis and Brucella abortus [17–19]. Y. enterocolitica invariably produces urease which has been reported to enable biovar 1B and biovar 4 strains to survive in the acidic environment of the stomach [20, 21]. However, the role of urease in the survival of biovar 1A strains has not been investigated. The objective of this study was to determine the genetic organization of urease (ure) gene cluster, factors affecting urease activity, and the survival of biovar 1A strain of Y. enterocolitica in acidic pH in vitro. Y. enterocolitica biovar 1A (serovar O:6,30) isolated from the stools of a diarrheic patient and deposited with Yersinia National Reference Laboratory and WHO Collaborating Center, Pasteur Institute (Paris) under reference number IP27403 was used to characterize ure gene complex and the enzyme urease. The details of other Y. enterocolitica strains used in this study namely serovars, source of isolation, country of origin, reference laboratory accession numbers and clonal groups have been reported previously . Y. enterocolitica 8081 (bioserovar 1B/O:8) was obtained from M. Skurnik (Haartman Institute, Helsinki, Finland). Y. enterocolitica IP26329 (bioserovar 2/O:9), IP26249 (bioserovar 2/O:5,27), and IP134 (bioserovar 4/O:3) were obtained from E. Carniel (Yersinia National Reference Laboratory and WHO Collaborating Center, Pasteur Institute, France). All strains were grown overnight at 28°C in Luria broth (HiMedia, Mumbai, India). Genomic DNA was isolated from overnight grown cultures using DNeasy tissue kit (Qiagen GmbH) as reported earlier . Urease gene sequences of Y. enterocolitica biovar 1B and biovar 4 with GenBank accession numbers L24101 and Z18865 respectively were used to design primers U1 and U2 using PrimerSelect 5.03 software (DNASTAR Inc., Madison, USA) such that the structural genes (ureA, ureB, ureC) may be amplified as one amplicon. As these primers failed to consistently amplify the ureABC region of biovar 1A strains, primers for amplification of each of the structural genes separately were designed from the following sequences in the database (accession numbers are given in parentheses): Y. enterocolitica biovar 1B (L24101, AM286415), Y. enterocolitica biovar 4 (Z18865), Y. aldovae (AY363680), Y. bercovieri (AY363681), Y. frederiksenii (AY363682), Y. intermedia (AY363683), Y. kristensenii (AY363684), Y. mollaretii (AY363685), Y. rohdei (AY363686), Y. pestis (AE017042, AL590842, AE009952, AF095636) and Y. pseudotuberculosis (U40842, BX936398). These sequences were also used to design primers for ure accessory (ureE, ureF, ureG, ureD) and urea transport (yut) genes. The most conserved regions for each of the genes were identified using MegAlign (DNASTAR) or ClustalW version 1.83 (accessible at http://www.ebi.ac.uk/tools/clustalW). Primer pairs - ureA1-ureA2 (for ureA), ureB1-ureB2 (for ureB), ureC1-ureC2 (for ureC), ureCE1-ureCE2 (for ureC-ureE and ureE), ureF1-ureF2 (for ureF), ureG1-ureG2 (for ureG), ureD1-ureD2 (for ureD) and yut1-yut2 (for yut) were designed from the conserved regions (Fig. 1) with PrimerSelect software. The sequences of the amplicons thus obtained (with strain IP27403) were used subsequently to design primers for the intergenic regions and a remaining part of the ureC gene. The intergenic regions between ureA-ureB, ureB-ureC, ureE-ureF, ureF-ureG and ureD-yut were amplified using primer pairs - ureAB1-ureAB2, ureBC1-ureBC2, ureE1-ureE2, ureFG1-ureFG2 and ureD3-ureD4 respectively and part of ureC gene by ureC3-ureC4. As ureD could not be amplified in biovar 1A strain with ureD1-ureD2, another primer pair ureG1-ureD2 was used for amplification of the ureG-ureD intergenic region and ureD gene. The primers were synthesized from Microsynth or Sigma Genosys. The details of the PCR primers and the target genes are given in Table 1. PCR amplification of urease structural (ureA, ureB, ureC) and the accessory (ureE, ureF, ureG, ureD) genes and the intergenic regions thereof, in Y. enterocolitica biovar 1A strain. The primer details and the PCR conditions used are given. Organization of ure gene cluster of Y. enterocolitica biovar 1A. Primers used for amplification of structural and accessory genes, and the intergenic regions thereof are indicated. PCRs for ure structural and accessory genes, intergenic regions and the yut gene were performed using a thermal cycler (MyCycler, Bio-Rad). The 25 μl PCR reaction mixture contained 100 ng of genomic DNA, 2.5 μl of 10 × Taq buffer containing 1.5 mM MgCl2, 2.5 μl of 2 mM dNTP, 25 pmol of each primer, and 2 U of Taq DNA polymerase (New England BioLabs). The details of the conditions used for amplification are given in Table 1. After amplification, 10 μl of the PCR product was resolved in 2% agarose gel in 1 × Tris-acetate-ethylenediaminetetraacetic acid (TAE) buffer (40 mM Tris-HCl, 20 mM acetic acid, 1 mM EDTA, pH 8.0) at 70 V for 2 h. The gels were stained with ethidium bromide (0.5 μg/ml) and photographed under UV-transillumination in a gel documentation system (Bio-Rad, CA). The 1 kb and 100 bp DNA ladders (New England BioLabs) served as molecular size markers. The PCR amplicons obtained above using the genomic DNA of Y. enterocolitica biovar 1A (strain IP27403) were extracted, purified using QIAquick Gel extraction kit (Qiagen) and sequenced directly in one or both directions (Microsynth, Balgach, Switzerland or LabIndia, Gurgaon, India). The sequences were analyzed, edited and compiled using Editseq and MegAlign of DNASTAR. Homology searches for nucleotide and deduced amino acid sequences were carried out by BLASTN and BLASTP respectively. The multiple nucleotide and protein sequence alignments were performed by MegAlign or ClustalW. The percent identity and similarity were calculated using MatGAT 2.02 . The theoretical molecular weight and isoelectric point (pI) of urease structural and accessory proteins were determined by EditSeq (DNASTAR). The open reading frames (ORFs) in the compiled ure gene cluster were identified using GeneMark , GeneMark.hmm , FGENESB  and the NCBI ORF finder  programs. All ORFs were checked further for homology to known protein sequences using BLASTX. The relationship of urease structural and accessory protein sequences of biovar 1A strain of Y. enterocolitica to sequences available in GenBank were determined by constructing phylogenetic trees with the program MEGA 4.0 using the neighbor-joining algorithm. Bootstrap value for each node of the tree was calculated over 1,000 replicate trees. Primer pairs ureAB3-ureAB4 and ureC1-ureC4 were designed to amplify the 1,004 bp and 1,727 bp of ureAB and ureC genes respectively (Fig. 1). The biovar 1A strains were chosen such that each belonged to a different serovar, country, source of isolation, REP/ERIC-type  and VNTR01-type . The PCR amplicon of ureAB was digested with HaeIII and Sau96I while that of ureC was digested with RsaI and Sau96I. The choice of the restriction enzymes was based on in silico restriction of the expected amplicons such that DNA fragments were amenable to separation by gel electrophoresis. Restriction enzymes were from New England BioLabs (RsaI and HaeIII) or Bangalore Genei (Sau96I). Ten microlitre of amplified DNA was digested with 2.5 U (HaeIII and Sau96I) or 5 U (RsaI) of restriction enzyme using appropriate buffer recommended by the manufacturer, in a total volume of 25 μl at 37°C overnight. The digested products were separated by electrophoresis in 2.5% agarose gel at 50 V for 5 h in TAE buffer. 100 bp ladder (New England BioLabs) was used as the molecular size standard. The gel was stained with ethidium bromide and examined under UV transillumination. Y. enterocolitica strain IP27403 was grown overnight at 28°C in 20 ml LB medium with shaking at 200 rpm. Cells were collected by centrifugation (9,000 × g, 10 min, 4°C), washed twice, and resuspended to 1.5 × 108 CFU/ml equivalent to 0.5 McFarland standard (A600 = 0.1). These were diluted to 1.0 × 106 CFU/ml and 50 μl of this suspension was inoculated into 50 ml of fresh LB medium, and incubated further (28°C, shaking at 200 rpm). Samples were withdrawn at different time intervals up to 78 h and diluted in 20 mM sodium phosphate buffer (pH 7.0). 0.1 ml of the appropriate dilution was plated, in triplicate, on Luria agar and incubated overnight at 28°C. The number of viable bacteria was recorded at different intervals and CFU/ml was calculated. The log10CFU/ml was plotted against incubation time (in h). For preparing lysate, cells grown in 50 ml LB medium were harvested by centrifugation, washed twice and resuspended in 2.5 ml of 20 mM sodium phosphate buffer (pH 7.0). Cells were disrupted by sonication with three cycles (2 s "pulse on" and 2 s "pulse off" for 2 min) at 25% intensity with Vibra-Cell (Sonics). The cell lysate was centrifuged at 18,000 × g for 30 min at 4°C to obtain cell-free extract. The supernatant was transferred to pre-chilled microcentrifuge tubes and used immediately for determination of urease activity. Protein concentration was estimated by Bradford  method using bovine serum albumin (Sigma) as standard. Urease activity in the cell extract was assayed by measuring release of ammonia from urea in the phenol-hypochlorite assay . Briefly, extract containing 2 μg of protein was added to 100 mM citrate buffer (pH 5.5) containing 50 mM urea in 200 μl of final volume. The mixture was incubated at 37°C for 15 min. A similar volume of the extract boiled for 10 min served as negative control. The reaction was terminated by the addition of 1.5 ml of solution containing 1% phenol and 0.005% sodium nitroprusside; this was followed by the addition of 1.5 ml solution containing 0.5% (w/v) NaOH and 0.044% (v/v) NaClO, and the contents were mixed well. Following incubation at 37°C for 30 min, the absorbance was measured at 625 nm using a spectrophotometer (UV-1700 Pharmaspec; Shimadzu Scientific Instruments Inc., Columbia, Md.). Assays were carried out in triplicate and the amount of the ammonia released per minute was determined. The quantity of ammonia (in nmol) released was calculated from the calibration curve obtained from appropriate dilutions of freshly prepared NH4Cl solution, which was determined to be linear between 20-500 nmol. Data are presented as specific activity of urease, defined as μmol of NH3/min/mg of protein. Stated values are the mean ± standard deviation of triplicate determinations. The optimum pH for urease was determined by measuring activity at pH 1.5 to 7.5. The assays were carried out in 20 mM sodium phosphate (for pH 1.5, 2.5, 5.5, 6.0, 6.5, 7.0 and 7.5) and 100 mM citrate (for pH 3.0, 3.5, 4.0 and 5.5) buffers. The optimum temperature for urease was determined by incubating the extract containing enzyme with substrate at different temperatures (18-75°C) in the phenol-hypochlorite assay described above. The kinetic data (Km and Vmax) of urease were calculated from Lineweaver-Burk plot of the initial rate of hydrolysis of urea in citrate buffer (100 mM, pH 5.5). To determine the effect of growth temperature and growth phase on urease activity, extracts were prepared from cells grown in shaking at 28°C and 37°C in LB medium for different time intervals. To determine the effect of urea and nickel on production of urease, medium was supplemented with urea (16.7 mM) or NiCl2 (up to 200 μM). Cell-free extracts from different biovars of Y. enterocolitica were electrophoresed on non-denaturing polyacrylamide gel . Briefly, extract containing ca. 100 μg of protein was mixed with 1× tracking dye and loaded on 5% resolving gel in 380 mM Tris-HCl (pH 8.8) with 4% stacking gel in 63 mM Tris-HCl (pH 6.8) in a mini-Protein III apparatus (Bio-Rad). Samples were electrophoresed with Tris-Glycine (pH 8.4) as the running buffer at 70 V for 2 h at 4°C. The gel was removed and equilibrated with 5-10 changes of solution containing 0.02% cresol red and 0.1% EDTA until the entire gel turned yellow. After draining the solution, gel was flooded with 1.5% (w/v) solution of urea. The pink bands of urease were recorded by scanning (UMAX Astra 3600). Urease from jack bean (Sigma) was used as the marker. SDS-PAGE was performed as per standard protocol . Briefly, extract containing 25 μg of protein was boiled in reducing Laemmli sample buffer and separated on 12% polyacrylamide gel. IEF of the cell extract was carried out in 6% polyacrylamide gel containing 2% ampholyte of pH 3-10 (Biolyte Ampholyte, Bio-Rad). 3-5 μl of extract containing ca. 20-25 μg of protein was loaded on the gel and focused at 4°C using a Mini IEF cell (Bio-Rad) according to the manufacturer's instructions. After focusing, the gel was equilibrated with a solution containing 0.02% cresol red and 0.1% EDTA. Urease bands were visualized by superimposing the gel with Whatman No. 1 filter paper presaturated with cresol red-EDTA solution containing 1.5% urea. Urease appeared as pink band against a yellow background. Broad range IEF standard with pI 4.45-9.6 (Bio-Rad) was used as the pI marker to determine the isoelectric point of the urease. The in vitro survival of Y. enterocolitica was performed by slight modification of the method reported earlier . Briefly, ten microlitre of the bacterial suspension was added to 1 ml of 20 mM sodium phosphate (for pH 2.5 and 7.0) or 100 mM citrate (for pH 4.0) buffer with or without 3.4 mM urea in 0.6% NaCl, and prewarmed to 37°C to give an initial count of ca. 7.0 log10CFU/ml. The contents were mixed and incubated with shaking at 37°C for 2 h. At the end of the incubation, samples were removed and diluted serially in 20 mM sodium phosphate buffer (pH 7.0). 0.1 ml of an appropriate dilution was plated on LB agar to determine CFU/ml. At conclusion of each assay, the pH of the buffer was recorded. All assays were repeated at least thrice on separate occasions. The mean and the standard deviation for each data set were calculated using Microsoft Excel 2003 software (Microsoft Corporation, Redmond, Wash.). Statistical significance was calculated using unpaired t test (Sigma Stat version 3.5). p value < 0.05 was considered significant. The nucleotide sequence data of ure gene complex and the yut gene reported in this paper have been deposited in GenBank database under accession numbers DQ350880 and EU527335 respectively. Primers U1 and U2 were designed to amplify the ure structural (ureA, ureB, ureC) genes of Y. enterocolitica. Although amplification was obtained with biovar 1B, 2 and 4 strains, these primers did not consistently amplify the ure structural genes of biovar 1A strains. Thus, new primers were designed to amplify each of the ure structural and accessory (ureE, ureF, ureG, ureD) genes separately, and the intergenic regions so as to encompass the entire urease gene cluster of biovar 1A strain. Amplicons of expected sizes were obtained for all genes except ureB and the intergenic regions namely ureA-ureB, ureB-ureC and ureC-ureE (Table 1). The sequences thus obtained were analyzed for homology with sequences available in databases, edited and combined to obtain 7,180 bp sequence of ure gene cluster of biovar 1A strain (See Additional file 1 for ure gene cluster sequence). Seven ORFs were identified in the ure gene cluster of Y. enterocolitica biovar 1A strain and designated as ureA, ureB, ureC, ureE, ureF, ureG and ureD (Fig. 1) as in the ure gene complex of Y. enterocolitica 8081 (biovar 1B, accession number AM286415). As with Y. enterocolitica 8081, yut gene which encodes a urea transport protein was present downstream of the ure gene cluster. All ORFs had ATG as the start codon except ureG where the start codon was GTG. These ORFs were preceded by ribosome-binding consensus sequence. Although ure gene cluster of biovar 1A strain was broadly similar to that of biovar 1B and biovar 4 strains, differences were identified. These were - smaller ureB gene and ureA-ureB intergenic region and larger ureB-ureC and ureC-ureE intergenic regions in biovar 1A strain (Table 2). The size of ureB gene of Y. enterocolitica biovar 1A was identical to ureB of Y. aldovae, Y. bercovieri, Y. intermedia, Y. mollaretii and exhibited higher nucleotide sequence identity to these species than to Y. enterocolitica biovar 1B or 4. The stop codon of ureG overlapped with the start codon of ureD gene. The G + C content of the urease gene cluster was 49.76% which was typical of Y. enterocolitica with G + C content of 47.27%. Urease structural and accessory genes and the intergenic regions thereof, in Y. enterocolitica biovar 1A. Comparison with different Yersinia spp. and other bacteria. The comparison of Y. enterocolitica biovar 1A ure genes and the deduced amino acid sequences with that of Yersinia spp. and other bacteria are given in Tables 2 and 3 respectively. Besides Yersinia species, the homologies of ure genes (upto 76% identity) and their deduced amino acid sequences (upto 86% identity and 95% similarity) were significant with ureases from Photorhabdus luminescens and Edwardsiella ictaluri. The UreA, UreC and UreG proteins were most conserved among Yersinia spp. The estimated molecular weights, in Da, of the protein subunits were 11,048 (UreA), 15,854 (UreB), 61,026 (UreC), 25,507 (UreE), 25,040 (UreF), 24,181 (UreG) and 36,592 (UreD) (Table 3). Urease structural and accessory proteins of Y. enterocolitica biovar 1A (Ye 1A). Phylogenetic analysis of urease structural and accessory proteins of Y. enterocolitica biovar 1A showed clustering with members of gamma-proteobacteria such as P. luminescens and E. ictaluri along with Yersinia spp. (See Additional files 2 and 3). These protein sequences were also related closely to members of alpha-proteobacteria like Methylobacterium chloromethanicum, M. extorquens, M. populi and Brucella spp. but were related distantly to other members of gamma-proteobacteria like Klebsiella aerogenes, P. mirabilis and Escherichia coli. The regions constituting the structural genes namely ureAB and ureC were amplified in several Y. enterocolitica biovar 1A strains using primer pairs AB3-AB4 and C1-C4 respectively. 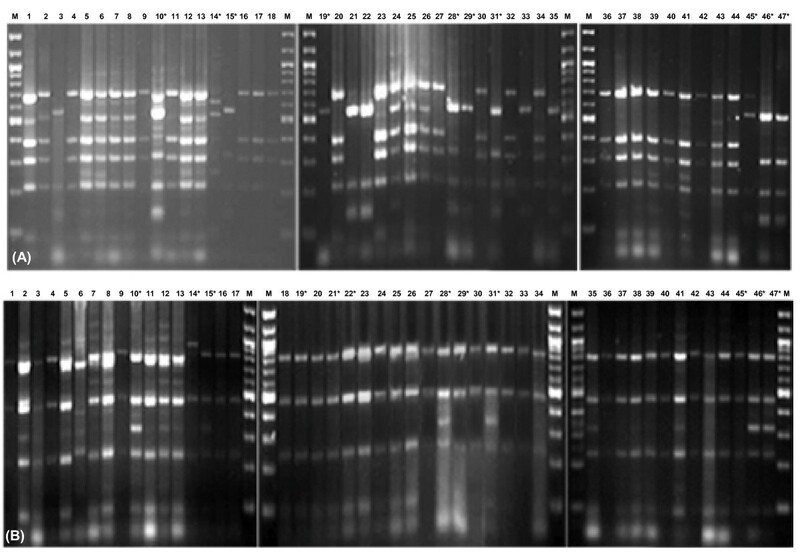 Restriction digestion of ureAB region with HaeIII and Sau96I resulted in almost identical patterns among all biovar 1A strains (See Additional file 4). But, differences were clearly evident in restriction profiles of ureC digested with RsaI and Sau96I (Fig. 2). With RsaI, strains belonging to clonal group A exhibited profile different from that of clonal group B strains. Thus, it may be inferred that sequence of urease gene in clonal group A strains is different from that of clonal group B strains. PCR-RFLP of ureC. PCR-RFLP of ureC of Y. enterocolitica biovar 1A strains amplified with primers ureC1-ureC4, and restriction digested using (A) RsaI and (B) Sau96I enzymes. Lanes 1: IP27360, 2: IP27362, 3: IP27364, 4: IP27365, 5: IP26310, 6: IP26311, 7: IP26312, 8: IP26315, 9: IP27403, 10: IP27407, 11: IP27429, 12: IP27433, 13: IP27434, 14: IP26261, 15: IP26305, 16: E1281580, 17: IP26316, 18: E1281550, 19: IP26152, 20: P346, 21: P354, 22: P386, 23: P472, 24: IP27404, 25: IP27406, 26: IP27430, 27: IP27432, 28: IP27484, 29: IP26147, 30: IP26148, 31: E1281600, 32: IP27385, 33: IP27386, 34: IP27388, 35: IP27485, 36: STM 126, 37: 8660/90 STM 484, 38: 0310/90, 39: ST5 NF-O, 40: IP27879, 41: IP27873, 42: IP27950, 43: IP27985, 44: IP24121, 45: IP27648, 46: IP27210, 47: IP27149, M: Molecular mass marker (100 bp ladder, New England BioLabs). * Strains belonging to clonal group B are shown in lanes 10, 14, 15, 19, 21, 22, 28, 29, 31, 45, 46 and 47. Clonal group A strains are in other lanes. For clonal groups refer to . The HaeIII and Sau96I restriction profiles of ureAB of biovar 1B, 2 and 4 strains were distinct from that of biovar 1A strains (See Additional file 4). As with ureAB, restriction patterns of ureC for these biovars were also quite distinct from biovar 1A strains (data not shown). The crude extract of urease of Y. enterocolitica biovar 1A strain was active over a pH range of 4.0-7.0. The maximum activity was observed at pH 5.5 (Fig. 3a). The enzyme was quite heat-stable as urease activity was recorded up to 65°C but decreased progressively at higher temperature (Fig. 3b). The optimum temperature for urease activity was 65°C (Fig. 3b). The urease exhibited Michaelis-Menten kinetics with Km and Vmax of 1.74 ± 0.4 mM urea and 7.29 ± 0.42 μmol of ammonia released/min/mg of protein respectively (data not shown). Biochemical characterization of Y. enterocolitica biovar 1A urease. (a) optimal pH for urease activity (b) effect of temperature on urease activity and (c) effect of growth phase and growth temperature on urease production; growth curve of biovar 1A strain grown at 28°C is also shown. Data points represent mean of triplicate determinations. The error bars indicate standard deviation. Y. enterocolitica biovar 1A grown at 28°C (optimum temperature for growth) exhibited higher urease activity than that grown at 37°C (Fig. 3c). Irrespective of the growth temperature, stationary phase cells showed higher activity (Fig. 3c). The supplementation of growth medium (Luria broth) with 16.7 mM urea did not show significant difference in urease activity. However, supplementation with nickel chloride resulted in ca. 10-fold increase in the activity. 1 μM NiCl2 was sufficient to induce urease activity as no significant increase in the activity was observed with further increase in concentration up to 200 μM (See Additional file 5). On native PAGE, urease was observed as two bands with the major band having molecular weight > 545 kDa and a slowly-developing band above it (Fig. 4). 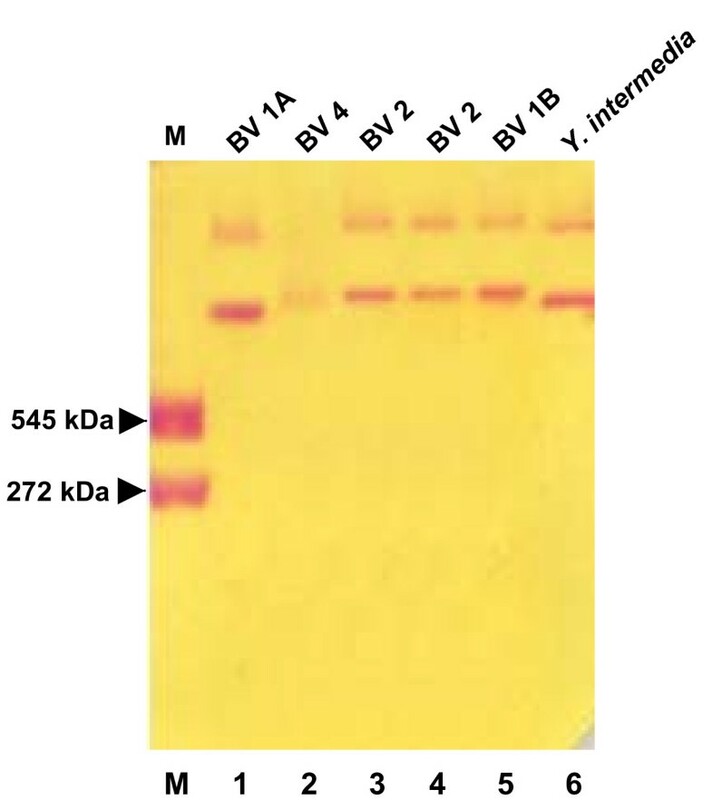 The electrophoretic mobility of urease of Y. enterocolitica biovar 1A strain was shown to be different from that of biovar 1B, 2 and 4 strains though similar to the Y. intermedia urease. The isoelectric point of the crude extract urease was 5.2. Non-denaturing PAGE showing urease activity of Yersinia spp. Lane 1: Y. enterocolitica IP27403 (1A/O:6,30); lane 2: Y. enterocolitica IP134 (4/O:3); lane 3: Y. enterocolitica IP26329 (2/O:9); lane 4: Y. enterocolitica IP26249 (2/O:5,27); lane 5: Y. enterocolitica 8081 (1B/O:8); lane 6: Y. intermedia IP27478 (serotype O:7,8-8); M: Jack bean urease [272 kDa (trimer) and 545 kDa (hexamer); BV: Biovar. The ability of Y. enterocolitica biovar 1A strain to survive at pH 2.5, 4.0 and 7.0 in vitro was investigated. Strains belonging to other biovars were also studied concurrently. The biovar 1A strain survived at pH 4.0 and 7.0 for 2 h without significant differences in their viable counts (Fig. 5). However, no viable cells were recovered after 2 h at pH 2.5. In fact, the decrease in the viable counts at this pH was evident even within 5 min of incubation. The addition of 3.4 mM urea at pH 2.5 was sufficient to increase the survival of Y. enterocolitica biovar 1A equivalent to that observed at pH 4.0 and 7.0. Similar results were observed for other biovars also. The pH of the assay medium at the end of experiment was same as that at the start, suggesting that increased survival of Y. enterocolitica was not due to any significant change in the pH. Survival of Y. enterocolitica in vitro at different pH. Number of bacterial cells (log10CFU/ml) of Y. enterocolitica after incubation for 2 h at pH 2.5, 4.0 and 7.0 in the absence and presence (U) of 3.4 mM urea. The values are mean of three independent observations. The error bars indicate standard deviation. The ure gene cluster of Y. enterocolitica biovar 1A strain included three structural (ureA, ureB, ureC) and four (ureE, ureF, ureG, ureD) accessory genes. The yut gene, which is required for transport of urea was present downstream of this cluster. Thus, the organization (ureABCEFGD) of ure gene cluster in Y. enterocolitica biovar 1A strain was similar to that reported for Y. enterocolitica biovar 1B, P. luminescens and E. ictaluri [23, 36, 37]. Similar organization has been reported for other species such as Streptococcus salivarius, Synechococcus sp. WH7805, and B. abortus ure-2 operon [19, 38, 39]. However, important differences were observed compared to urease genes of Y. enterocolitica biovar 1B and biovar 4 strains. These included differences in the size of ureB gene and the intergenic regions. Also, the restriction profiles of ure structural genes of biovar 1A strains were different from that of biovars 1B, 2 and 4. These observations indicated that RFLP of urease genes may be used to study the epidemiology of Y. enterocolitica. The amino acid residues in the urease structural proteins namely UreA (γ subunit), UreB (β subunit) and UreC (α subunit) that are reported to have functional significance in K. aerogenes urease  were also conserved in Y. enterocolitica biovar 1A. The crystallographic  and genetic  analysis of K. aerogenes urease has shown that four histidine residues (His-134, -136, -246 and -272), an aspartate (Asp-360) and a carbamylated lysine (Lys-217) of UreC are involved in nickel metallocenter binding. All these amino acids were conserved at positions His-139, -141, -251, -277; Asp-365 and Lys-222 in UreC of Y. enterocolitica biovar 1A. Histidine residues in the α-subunit of K. aerogenes shown to be important for substrate binding (His-219) and catalysis (His-320) are present at positions 224 and 325 in α-subunit of biovar 1A . The urease active-site consensus sequence (MVCHHLD)  deviated by two residues (MVCHNLN) in biovar 1A strain. Amino acid residues with functional significance including His-97 (UreA) and His-39, -41 (UreB)  were also conserved in relative positions in Y. enterocolitica biovar 1A. The conservation of amino acids in Y. enterocolitica biovar 1A urease involved in coordination of nickel at active site, substrate binding and catalysis as seen in K. aerogenes urease, suggested similar quaternary structure of the two enzymes. UreE consisted of histidine-rich motif at carboxy terminus as in UreE of K. aerogenes, B. abortus, Actinobacillus pleuropneumoniae, E. ictaluri and Synechococcus [19, 36, 39, 43, 44]. A P-loop motif (GPVGSGKT), which contains ATP and GTP binding sites  and probably provides energy for Ni activation  was present at the amino terminus (positions 19-26) of UreG. 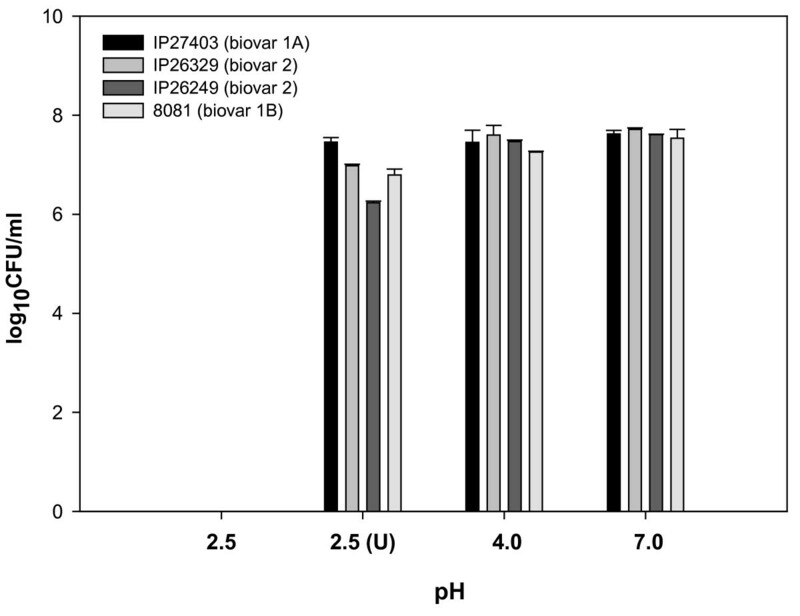 A pH optimum in the acidic range for urease produced by a neutrophile like Y. enterocolitica biovar 1A was similar to that reported for Y. enterocolitica biovars 1B and 4, and Morganella morganii [35, 47]. Ureases with optima in the acidic range reportedly carried a phenylalanine seven residues towards N-terminus, and an asparagine one residue toward the C-terminus, from the catalytic site . Both these residues are also present at respective positions in UreC of Y. enterocolitica biovar 1A. The maximal activity of urease at 65°C by Y. enterocolitica biovar 1A has also been reported for other bacteria . A low Km of Y. enterocolitica biovar 1A urease as in biovar 4 strains , indicated its high affinity for urea. This suggested that the enzyme might function quite normally in the gut despite low concentrations (1.7-3.4 mM) of the urea available there. Also, consistent with our observation, organisms which produce urease with low Km have been reported to possess urea transport (yut) gene as seen in S. salivarius, Lactobacillus fermentum, Bacillus sp. strain TB-90 and B. suis . The cultural conditions which affected production of urease by Y. enterocolitica biovar 1A included growth phase, growth temperature and availability of nickel ions. The expression of bacterial ureases is known to be either constitutive or induced by factors like low nitrogen, urea or pH . The maximal urease activity during stationary phase of the growth and at 28°C as observed for Y. enterocolitica biovar 1A strain was consistent with that of biovar 4 strains . In Y. enterocolitica, several other virulence factors such as invasin, Myf fibrillae and enterotoxin have also been reported to be regulated by growth phase and the growth temperature . A 10-fold increase in urease activity following supplementation of growth medium with nickel was not accompanied by increase in the expression of urease structural proteins suggesting that increased activity was probably due to the activation of pre-existing apoenzyme. Nickel has been reported to regulate both expression and activity of urease in H. pylori . In silico analysis of whole genome of Y. enterocolitica 8081 (biovar 1B) revealed two systems (ureH and ynt) for transport of nickel. It would be interesting to determine the role of multiple nickel transport genes in urease activity and its regulation in Y. enterocolitica. The Mw of Y. enterocolitica biovar 1A urease as assessed from native PAGE was > 545 kDa. The molecular mass of urease is known to vary from as low as 130 kDa in B. suis  to as high as 620 kDa in Providencia rettgeri or > 700 kDa in M. morganii . The difference in the molecular mass of urease of Y. enterocolitica biovar 1A vis-à-vis Y. enterocolitica biovar 1B and biovar 4 seems to be due to difference in the size of UreB (β-subunit), which is smaller in the former and thus may account for its lower molecular mass. The isoelectric point (pI) of 5.2 of biovar 1A urease was close to that reported for Proteus penneri (pI = 5.1) and H. pylori (pI = 5.9) urease [33, 54]. No data on molecular mass and isoelectric point of ureases produced by Y. enterocolitica strains belonging to other biovars has been reported. The ability of Y. enterocolitica biovar 1A strains to survive at pH 2.5 in vitro in the presence of 3.4 mM urea implicated urease in their survival. This suggested the possible role urease might play in the survival of Y. enterocolitica biovar 1A under acidic conditions in the gut. However, this needs to be confirmed by comparison of wild type strain with an isogenic urease mutant. The role of urease in survival during transit through gut has been reported for B. suis, B. abortus, H. pylori and E. ictaluri [18, 19, 36, 55, 56]. Interestingly, the biovar 1A strains have also been reported to resist killing, and survive within macrophages . It would therefore be worthwhile to determine the role urease may play in the survival of Y. enterocolitica biovar 1A strains in the acidic environment of phagolysosomes. The ure gene cluster of Y. enterocolitica biovar 1A though broadly similar to that of biovar 1B and biovar 4 strains showed differences in structural (ureB) genes and the intergenic regions thereof. The kinetic data indicated that urease produced by Y. enterocolitica biovar 1A strain would be active at low concentration of urea typically present in the gut. The ability of biovar 1A strain to survive at acidic pH in the presence of urea suggested that urease might play role in their survival in the gut. This however needs to be corroborated using ure isogenic mutants. This work was supported by research grants to JSV from Indian Council of Medical Research (ICMR) and Defence Research and Development Organization (DRDO) and Senior Research Fellowship to NB from Indian Council of Medical Research (ICMR), New Delhi. The financial assistance from University of Delhi to strengthen R & D doctoral research programme is also acknowledged gratefully. NB carried out the experimental part of the study. JSV conceived and supervised the work. Both authors participated in interpretation of data and preparation of the final manuscript.